Just when I got back down to earth from my day photographing a Spitfire (Mark Nine) at Duxford, it was “chocks away” again, as I had a mission to complete in Mullion, Cornwall! In my line of work, I get to meet and photograph many well-known people on a very private and confidential level which, I find is very satisfying, for to be invited into their world, trusted and respected, is something I treasure dearly. Sometimes, however, I get to work in the public eye. For example, when I photographed the calendar of female Olympic athletes for four various charities. Or in 2010 when I did my “celebrities with things or places from childhood” exhibition for The Meningitis Trust. I gained something very special from these projects. I realised that by pressing a button, I could help and change people’s lives for the better. This is what I feel is my calling. 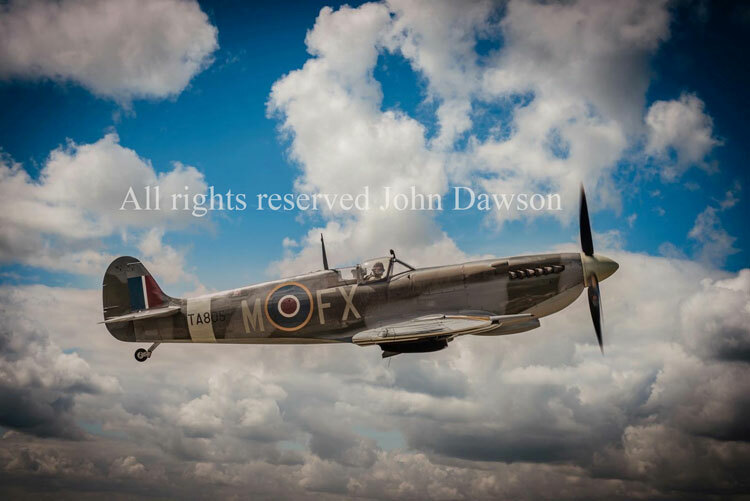 After printing twenty three of my Spitfire pictures to A3 size, I was heading to Cornwall, embarking on another charity photographic project. I was going to meet Geoffrey Wellum DFC. For those of you who do not know, Geoffrey is one of the few. Geoffrey Wellum DFC was the youngest Spitfire pilot in The Battle Of Britain. He is one person I have always wanted to meet and shake hands with since I was a boy growing up and listening to my father’s eye witness accounts from World War Two. I was due to meet him at his home on the Saturday, so leaving nothing to chance, I headed off with my friend Kev on the Friday. The traffic was not good, but for once I didn’t care. I was meeting a hero of mine. We finally arrived at The Mounts Bay hotel about nine o’clock in the evening, checked in and headed for the bar to get some food and drink. We soon got chatting to the locals, only to find that Mr Wellum was a very well-known and respected local celebrity. This pleased Kev and myself, as we both feel that this man should get all the recognition he deserves. “Can you do me a favour when you meet Geoffrey tomorrow?” one of the bar staff asked. “Of course, what would you like?” I said. “Can you give Geoffrey his pork? The butcher had to go early and could not deliver it to him”. “Of course, remind me tomorrow and I will give Mr Wellum his Sunday lunch”. What an introduction. I was about to meet one of the few that helped save our lives, with a lump of meat. Made even more ironic by the fact that I am pescatarian! The next morning, despite a little woolly from the previous night’s wine, I woke up like a kid on Christmas day. Finally, after over a year of planning with Geoffrey’s daughter Deborah, I was going to meet Mr Geoffrey Wellum DFC himself! It is at this point I would like to thank Cheryl and Peter, the owners of The Mounts Bay hotel, for offering Geoffrey to use their bar area to sign the pictures. 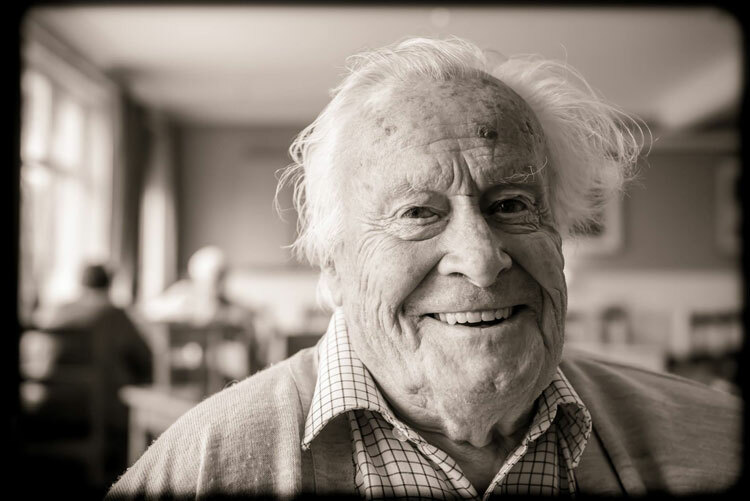 Kev (my friend and photographer) and I arrived at the house punctually at eleven o’clock, and there he was, Geoffrey Wellum DFC, standing at his front porch. “Mr Dawson” Geoffrey announced. It was at this point I had the sudden realisation! What an introduction, not as I had anticipated after a year of planning. After a brief apology and explanation, I mentioned the kind offer of being able to sign the pictures back at the hotel. Geoffrey liked that idea and suggested that we meet back there in about twenty minutes. As promised, Geoffrey entered the hotel after a short journey. I thanked him for his time, generosity and for helping save my country back in 1940! We soon got down to business. With Kevin clicking away with my Nikon D800, the same camera and lens I used to photograph the Spitfire. I must say, he did a great job. Hikers who come in looked very confused. Little did they know that this elderly “gentleman” is a national hero. (I think this is a real shame, since people are famous for doing absolutely nothing these days, it would appear (sorry rant over). Geoffrey and I spent about half an hour signing and chatting about his war time experiences and then we both went to the bar. Geoffrey sat in his usual space and it was my absolute pleasure to buy this man a beer. I could not resist and asked him if I could take a portrait of him. He kindly said yes and within half a second I rattled off three pictures. I had caught him perfectly, still with that cheeky “Boy Wellum” smile. After about thirty minutes Geoffrey had to go. It was me who was smiling from ear to ear, and that’ a big smile when you see the size of my ears! Geoffrey left the hotel with a light drizzle coming down, but this day could not have been brighter for me. Amazing to think that even after all these years Geoffrey is helping save and improve people’s lives, and by pressing my camera trigger, I hope to do the same. 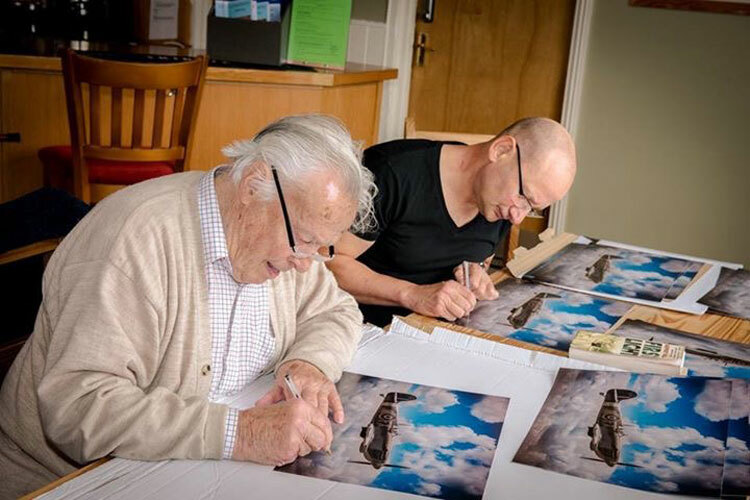 The twenty three images signed by Geoffrey and I have been beautifully framed and will be donated to various charities to help raise money for people in need. So far, one image was donated by Geoffrey and was auctioned off at Mount Bay Hotel. It raised £1000 which will be split between the Cornwall Air Ambulance and The Headland Appeal. On Friday, at the Ron Noades Memorial Dinner at Surrey National Golf Club, we will see another one go to auction. This time in aid of the Motor Neurone Disease Association. I will keep you all posted on Twitter, Facebook and Instagram with continued news on the project. If you wish to contribute a donation to any of these amazing charities, just follow the links. Every little helps!